Above: Absinthe Makes the Heart is shown outdoors above, and indoors with a flash, below. Below: These pictures were all taken outdoors, no flash. Click to enlarge finish detail. 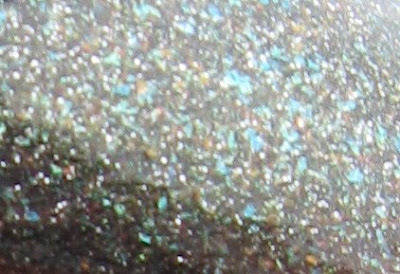 Below: Close-up of the shimmer and glitter colors. I'll be the first to admit, I bought this polish just for the name. It's a bonus that I also happen to love the color, which is a charcoal based shade filled with green, aqua and silver shimmering glitter. It's not really a green, but more of a grey, with the shimmer adding a green tone to it. 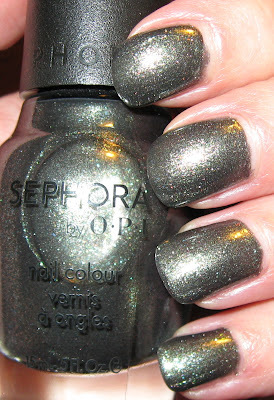 Absinthe in reality is a brighter shade of green, but this color combination makes for a stunning polish shade. I'm not crazy about this brand, but they do come out with some distinct hues several times a year. I used 3 coats and the drying time was more than I would've liked, but I'll overlook it because of the name and the pretty color. I recently bought this during the ongoing Sephora Family and Friends sale, so the usual $9.00 price was a bit less with the 20% off. Absinthe Makes the Heart is a cute play on the phrase Absence Makes the Heart Grow Fonder, as most alcoholic beverages do! I've long been a fan of the art nouveau posters that have been reproduced over the years for Absinthe and for the tales and lore discussing the evils of this fabled beverage. All the more reason to buy this polish...as if I needed a reason! "After the first glass, you see things as you wish they were. After the second, you see things as they are not. Finally you see things as they really are, which is the most horrible thing in the world. "~Oscar Wilde "
I really like this color! Those quotes are great too! I so badly want this colour. So badly. I love the quotes,so dramatic and poetical. A very cool looking color too. Haha, I've always had an interest in art nouveau and absinthe as well! :) Alphonse Mucha is one of my all time favorite artists! Love the art nouveau fonts as well. I've been thinking about getting this polish just for the name - it's such a great name! I bought this during the sale also. Looks fantastic on you. Abstinthe is a fascinating liquer because of reading about it in literature. Thanks for the quotes. I bought this too! And it looks fabulous on you! i am in love with this color! i am really pleased with how it looks, but i am so unimpressed with sephora by opi. im not sure why but i will only buy certain colors from the collection if i REALLY want them..otherwise forget it! Your nails look great though! This is a very nice shade of grey and I really like its glitter. gorgeous colour on you, Mary! and great quotes too! I love this post! I am enchanted by tales of the absinthe fairy and the lure of the quotes. The color is spellbinding and the name makes it even better! Anyway - I think this color is stunning! Gah, why oh why aren't we internationals able to get these Sephora exclusives - they are so pretty...*droolz*..
Vanessa~it tastes pretty nasty! Glad you like the blog layout :) I adore this shade, it's really totally different from anything else I have. Helen~thank you, I just love it. Good reason to refrain from the Absinthe! Diana~thanks! It's interesting stuff, that Absinthe! KONADomania~thank you, I knew I had to include a little more about Absinthe than just the polish itself. There's so much about it that's interesting...don't know how much of it is true, but it's still interesting. Tuli~glad to have you back and it sounds like you had a lovely time on your visit here. Katie~I did but the entire Mermaid collection last Spring, but I'm like you. I don't have but a couple of other ones from this line. Nail Fanatic~I think we have the same taste in polish shades! It is beautiful, isn't it. Lucy~I'm glad you got it also. Don't you just love it? The quotes were really interesting and I suppose somewhat true, if you drink enough of it! Nicole~I'm happy that you enjoy these oddities as well! It's interesting stuff that Absinthe and everything that goes along with it just catches my interest, for some reason. Velvet~yes, such deep thoughts one has under the influence of Absinthe...ha-ha! Selina~I am so happy I got it, it's just so pretty and different. Nessa~did you order it? You *need* to! The quotes are very interesting, glad you like them.